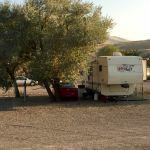 Ask fellow campers about "Elko RV Park At Ryndon" and nearby attractions. Easy access from I-80. Wide interior sites make access easy within the park. Most sites are pull-throughs. Hookups worked fine, no cable, internet was very fast. Many sites are in the open but many others have trees which may hinder satellite reception. Roads and sites are gravel and fine grit so it can be dusty. Lot of long-term residents and a lot of "stuff" around the park (both residents and the park itself), so the place is not very scenic. But everyone we met was friendly and staff was very helpful. There is a tavern adjacent to the office which is open daily from 3 to 10. No pool, playground or much else in the way of amenities. Not much in the area around the park but it is only 15 minutes to downtown Elko on I-80. I would stay here again. We camped at Elko RV Park At Ryndon in a Motorhome. Some good restaurants in downtown Elko. My favorite was the Coffee Mug - great local place with extensive breakfast, lunch and dinner menu. Food and service was excellent. This is a great place to get off the interstate. The park has excellent access off I 80 and we were able to get a space under some trees with grass, it was hot so this was very nice. The park was running new fiber optics for a better wifi system when we were there and from the sound of it the new system will be able to run live streaming video. The park was clean and quit. We camped at Elko RV Park At Ryndon in a Fifth Wheel. Good power, water, sewer. Pull thru so short that I pulled far forward into road and my 50 foot water hose needed additional hose to reach water spickett. Could not find reservation (they use post it notes on wall) but they did accomodate us. Used for overnight stop. Gas station across the interstate, but not a lot around otherwise. Would not stay here again. Mostly permanent park, friendly but run down. We camped at Elko RV Park At Ryndon in a Motorhome. Very friendly, helpful staff. FHU worked fine. We needed an overnight stop and this worked for us. Plenty of room to move about and long enough for the MH and jeep so we didn't unhook. Staff escorted us to our site, transported wife to office for payment and brought her back. All gravel with some trees for a little shade. Easy access on and off freeway. Place is a little ruff, but everyone we encountered were friendly. I would stay again under same circumstances. We camped at Elko RV Park At Ryndon in a Motorhome. Stayed here overnight. Campground is about 10mi east of Elko and was reasonably priced compared to some other places. Staff were friendly. Many permanent campers but they keep their sites clean. Sites are pull-through gravel, level with full hook-ups. There is a bar and casino on site and a small store. Lots of road noise. We didn't use any amenities. We camped at Elko RV Park At Ryndon in a Fifth Wheel. RV park not a resort. No tax with GS. All pull thru level gravel sites with FHU. Some with trees, some open. RR next to office and bar which opens at 3 pm. Not very good but reasonable place and price to stop for a nite between Salt Lake City & Reno. 10 miles east of Elko. Easy on/off I-80 ¼ mile away. My GPS displayed it as Ryndon RV park, but entrance sign was Elko RV Park. Would stay again. GS. 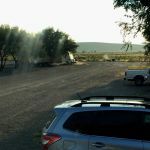 We camped at Elko RV Park At Ryndon in a Fifth Wheel. Between the highway and railroad tracks but thankfully neither was that noisy. Of course my ac was on most of the time. Looked at other parks closer into town. This one is about 10 miles outside Elko. The parks in town which were more expensive but prettier were also right next to the railroad switching station. Overall I would stay here again if I ever had to pass this way again. I heard a couple dogs bark but not for long periods of time and most of the full timers keep their lots nice. 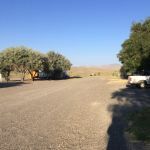 We camped at Elko RV Park At Ryndon in a Fifth Wheel. First the pros: (1) Located right next to I-80 (2) Friendly staff (3) Large sites Now the cons: (1) Cages with dogs in numerous sites (2) Old RVs with all kinds of trash all around them (3) More of a trailer park than an RV park because of the large number of long-termers and perms. But for an overnight stop, this park is fine and reasonably priced. Quiet hours are 8 PM to 8 AM, and the dogs didn't start barking until around 7:30 AM There was no cable TV, but we received at least 12 OTA station crystal-clear. Wi-Fi was also good. Our site was level with lots of room. We camped at Elko RV Park At Ryndon in a Motorhome. This was the first campground we've been in during the last three months that has not had even one pile of dog crap on the ground. Like the previous reviewer, our rating is 9 because this campground is great for what it's supposed to be which is an overnight stop. It's just off I-80 on the south side of Exit 314. (GPS can't find it but you can see it from the highway.) Road noise wasn't loud, never heard the train other reviewers mentioned. Site was easy in and out with lots of gravel. Did not have to unhook. Good wifi and TV. Very nice staff. Plenty of room to walk dog. Would definitely stay again. We camped at Elko RV Park At Ryndon in a Fifth Wheel. Stayed here on our way to deer camp in October. The park is located directly off I-80 at exit 314, The park was clean, quiet, and the staff was helpful. One staff member even gave our group some good local advisc as to where to start our deer hunt. We got three bucks in the area that was given to us, so he wasn't BSing. The little onsite bar was open till ten and was a nice break from the road. I will be back next year if I'm lucky enough to draw a tag.. We camped at Elko RV Park At Ryndon in a Travel Trailer. Worst park we have stayed at. There was dog doo in our site, manager was very rude, the bar patrons very loud and there were even dead birds laying around. Do your self a favor and keep on trucking past this dump. We camped at Elko RV Park At Ryndon in a Fifth Wheel. We have stopped here for years and have found the park to be clean and well maintained, especially with the current owners. Even if most of the park has full time residents the park is quiet and clean. Some workers coming and going during the night but not disruptive. Full hookups and drive-thru convenient stopover. It has grass and shade trees. It is 10 miles to Elko but easy off and on from I-80. Will return. 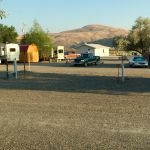 We camped at Elko RV Park At Ryndon in a Travel Trailer. This park is composed of mostly permanent residents, but the maintenance is quite good. It is obvious to me that they take pride in their park's appearance. They do keep in reserve a few spots for overnighters like us. The Wi-Fi works great....I am typing this review using their WiFi from site 53. The staff were courteous and efficient. Our check in took less than 5 minutes, and then we were led to our site. There are railroad tracks about 1/2 mile away on the other side of the Humbolt River, but I only heard one train during our stay about 5 in the morning. Even though we are only a few hundred yards from I-80 the traffic noise was not noticeable. We would stay here again. We camped at Elko RV Park At Ryndon in a Motorhome. Are you affiliated with Elko RV Park At Ryndon ?